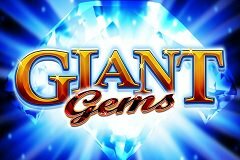 You’ll feel like you’re in a jewellers while spinning the reels of Giant Gems by NextGen Gaming as big red rubies, blue sapphires, green emeralds and purple amethysts all sparkle brightly, however, if it’s diamonds you are seeking, you’ll have to prove you’re a high roller by splashing the cash! While most gem-themed slots, including the likes of Glitter Gems by Ainsworth and Gems Gems Gems by WMS, boast impressive aesthetics with the glistening gems all looking very realistic, you’ll find it quite unbelievable that Giant Gems was only released in 2016 as the lacklustre graphics make it feel like it dates to the previous decade – most disappointing! A mix of blue hues have been used for the background to represent the glow of a diamond as an energetic soundtrack gets you in upbeat spirits before you line up a minimum of three matching symbols, however, the payout is the only thing you’ll be enjoying as wins are simply greeted by the sound of a ‘ding’ before the symbols rotate. Boasting a simple structure of 5 reels and 3 rows of sparkling symbols and 10 fixed paylines, the Giant Gems video slot can be played for real money from a minimum of just 10p per spin. Interestingly, Giant Gems is a ‘pay all ways’ slot which means you’ll paid for matching at least three symbols on adjacent reels beginning on the leftmost or rightmost reel and you’ll also win if they appear across the second, third and fourth reels. A quick review of the pay table highlights that the payout percentage of Giant Gems varies greatly, between 93.75% and 96.12%, as this will depend on whether you are playing the base game or Fortune Spins. This sees you pay a side bet to introduce up to five Giant Gems, which are 3x3 in size and represented by diamonds, with a low-valued symbol removed from the reels for each that you activate for sparkling wins worth up to 500x! While you’ll be hoping an abundance of gems appear on the reels, five playing card symbols have been included in Giant Gems and it’s these you’ll be seeing sparkle most frequently. Prizes worth up to 150 coins are on offer for lining up Q, J or 10 symbols, while greater rewards of up to 200 coins are on offer for matching sets of A and K symbols. Sets of purple amethysts and green emeralds shining brightly on the reels see you secure up to 400 coins, blue sapphires shining brightly will have you smiling as you reel in up to 1,000 coins, while red rubies are the ultimate sight as they see you win up to 5,000 coins. If you’re wondering why we haven’t mentioned what diamonds are available yet, that’s because they only appear if you put your hand in your pocket and activate the Fortune Spins feature. As any husband with a high maintenance wife will know, diamonds are very expensive, and you’ll have to pay a premium if you want them to appear in this free Giant Gems slot machine too. Clicking the ‘Fortune Spins’ button below the reels sees you presented with a screen that sees you select your bet with sparkling diamonds introduced as less low-paying symbols are removed from the reels. There are five betting levels here with the first level introducing a purple diamond that is worth up to 100x and sees the 10 symbols removed at a cost of 2x your stake, activating the second level sees green diamonds activated too with these being worth up to 200x as J symbols are also removed from the reels at a cost of 4x your original stake. Level three sees blue diamonds worth up to 300x added as Q symbols are removed with this costing 6x your stake, it costs 8x your stake to activate red diamonds worth up to 400x with K symbols removed, while the fifth and final level sees you pay 10x your stake to activate white diamonds worth up to 500x that see A symbols removed from the reel set. The level you decide to activate will likely depend on the size of your bankroll and how much of a gambler you are, but whichever diamonds you activate, you’ll be hoping to see them appear in full view across the second, third and fourth reels at the same time as it means you’ve won a giant prize! I’m sure you won’t be expecting much upon viewing the gaudy graphics, however, Giant Gems boasts a shiny surprise in the form of Fortune Spins which are essentially the only reason you’ll be spinning these sparkling reels. Tread very carefully, though, as paying a premium to activate Fortune Spins only for no diamonds to shine across the three central reels will have you thinking it’s been a giant disappointment!